Torpedo was one of the pioneer manufacturers that, at the beginning of this century, played its part in the motorization of the Austro-Hungarian Empire- particularly in its industrial heartland of Bohemia-Moravia. The firm was founded in 1903 at Kolin, east of Prague, by Trojan and Nagl. Its existence was brief, with production ending in 1912. 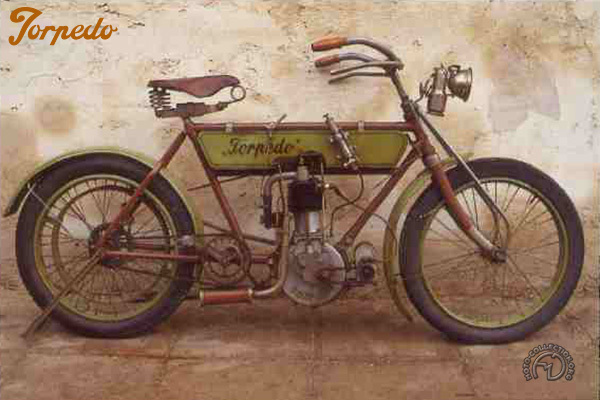 The Torpedo marque is best remembered for manufacturing extremely high quality motorcycles. Designed by Frantisek Trojan, they were entirely built at the works, right down to the carburetor. Two models were initially available, both single-cylinder machines. One was a 330cc developing 3.5 hp, the other a 500cc 4 hp bike with opposed valves (an automatic overhead intake valve and a mechanically-operated side exhaust valve). Then the company progressed to mechanically-operated overhead intake and exhaust valves, as on this rare survivor dating from 1905. Torpedo also built V-twins of 6 and 8 hp. Even if the level of production never attained the level of the marque's major competitors in Bohemia such as Laurin-Klement, Puch or Walter, the Torpedo was still one of the best machines built in the old Austro-Hungarian Empire. Some were still in regular use in what had become Czechoslovakia after WWI, while spare parts – made in the 1920s by the works after reconstruction – remained available for a long time. The main illustration shows the F-head 500cc Torpedo of 1905. Inset is a 330cc single from 1904 with an automatic intake valve.